Contemporary rugs run the gamut and can range from shimmering monochromatic floor coverings to brilliant and bold designs. Geometrics figure in greatly to contemporary styles, and so do the tactile aesthetics of the weave underfoot. Often, designers integrate bamboo silks for a subtle shimmer or play with the pile length for a three-dimensional look. 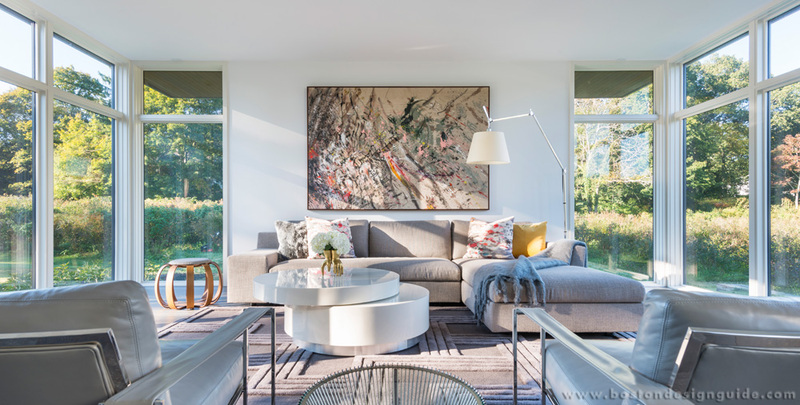 For a modern home in Lexington, Atsu Gunther, principal of Atsu Gunther Design, chose a soft taupe area rug for a light-filled living room. The plush, single-toned rug has an air of luxury and is at peace with both the landscape outdoors and the furnishings within. A study of angles and fiber lengths, the rug is a departure from the ultra smooth lines of the oval coffee table and end table, yet wholly in keeping with the sectional and rectangular armchairs. Mitchell Gold + Bob Williams takes a similar, albeit tighter, approach to pattern with its handcrafted Montmartre rug. Inspired by the cobblestone streets of Paris, each shape within the rug’s design is outlined in bamboo pile. 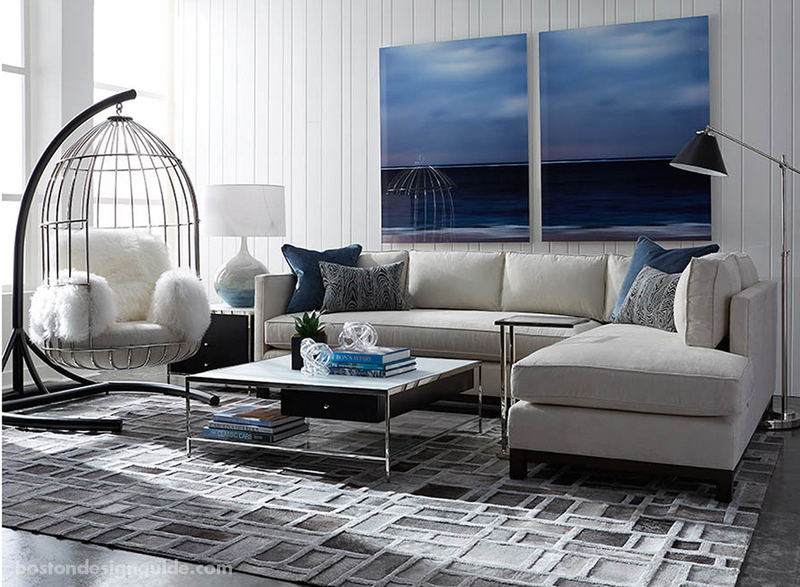 The variations in the natural cowhide pave the way for the living room’s other modern elements, including a sectional sofa you can sink in to, a pair of moody blue paintings and the iconic 70’s style Bastille birdcage chair with Tibetan fur. Spyder Table designed by Philip Jackson for Cattelan Italian and Jive collection rug, available at IL Décor. 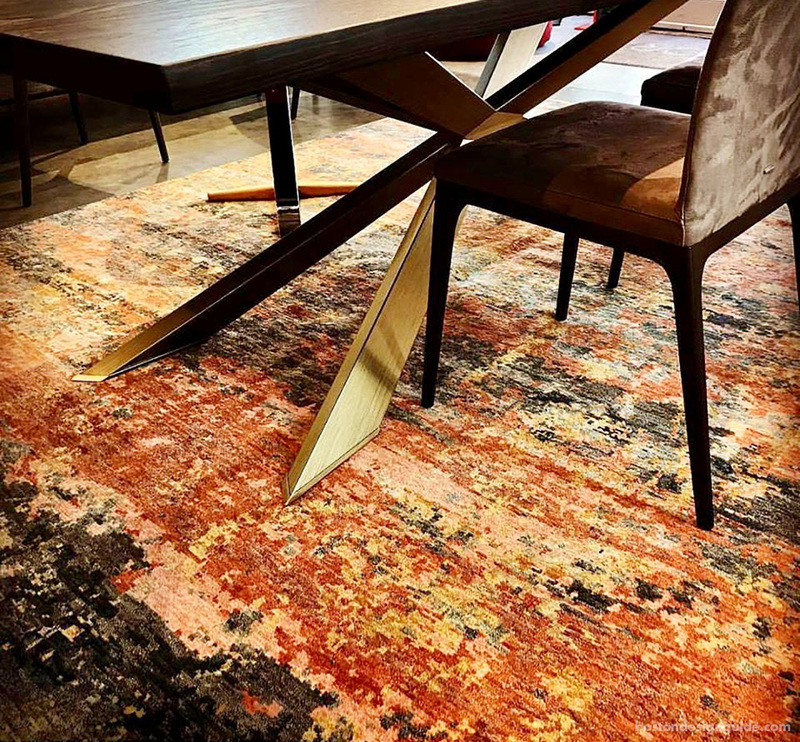 Modern furniture purveyor IL Décor has recently partnered with Landry & Arcari to offer beautiful broadloom and hand-woven rugs in its showroom that coordinate brilliantly with the retailer's European lines. The Jive collection rug from India, shown above, instantly amplifies IL Décor’s dazzling Spyder Table with its warm and brassy tones. We can't imagine improving on this pairing, but Philip Jackson’s sleek table has multiple design options for the base and top finish to cater to all tastes and styles. Zeus dining table by Cattelan Italia and Landry & Arcari’s Dream Tree, Night rug, available at IL Décor. 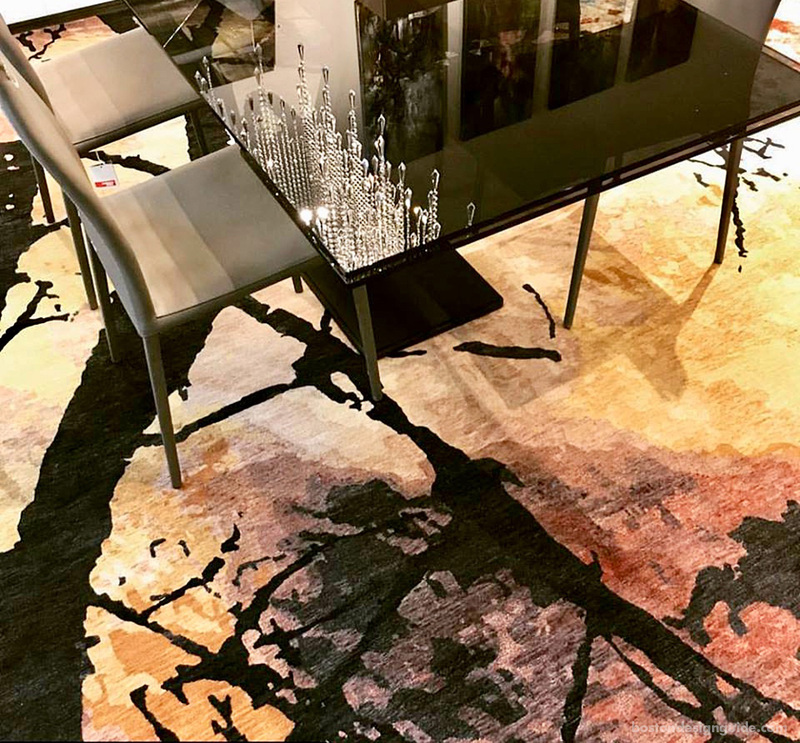 Cattelan Italia’s Zeus dining table with Landry & Arcari’s Dream Tree wool rug in “Night” is another resplendent modern duo at IL Décor. Even without the crystal chandelier glittering in its reflection, the smoky table has glamour in spades and casts a powerful spell above Landry & Arcari’s kinetic abstract rug. 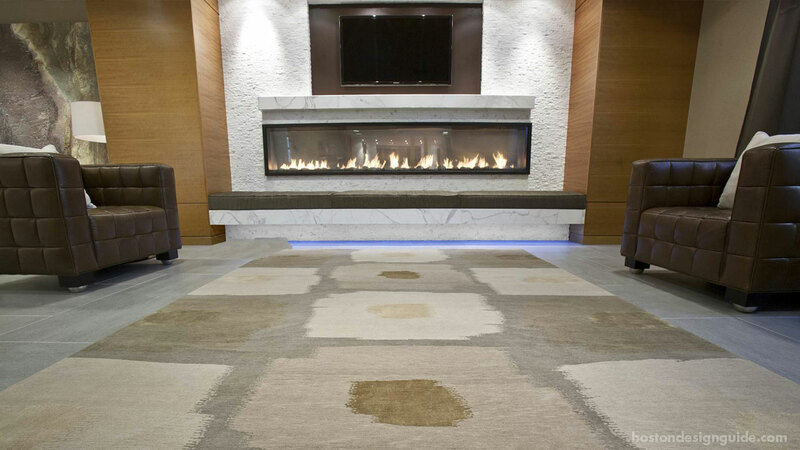 Contemporary rugs can also serve as great unifiers, pulling together the components and furnishings of a room. Dover Rug’s textile above, with its neutral tones, abstract pattern and barely-there pile, is the perfect choice for this living room space. It unites the room’s elements—the cement floors, marble and stone fireplace surround, fawn millwork and espresso quilted leather armchairs—for a natural and harmonious effect. We’d be remiss if we left out animal prints, which have a decidedly on-trend and exotic sensibility. Nigohsians’ Carpet & Rug’s zebra carpet has animal magnetism in spades and a “go-big-or-go-home” mentality that defines this master bedroom. It’s dynamite with the chocolate and bright white solids that adorn this space—from the walls to the oversized headboard to the fur throw. Those looking for a more understated silhouette can go smaller-scale, opting instead for a cowhide throw rug for their zebra stripes. This type of rug has a fresh appeal, an interesting, authentic shape and instantly updates a space. In this pristine modern home designed by LDa Architecture & Interiors, the zebra hide rug and its pillow companion warms a pair of metallic egg chairs and the cement flooring that flows out to the poolside. PRO TIP: Animal prints don’t fall neatly into one style or context. While we’ve shown them in contemporary spaces, animal prints, used sparingly, can often be found in classic spaces, and even among antiques. 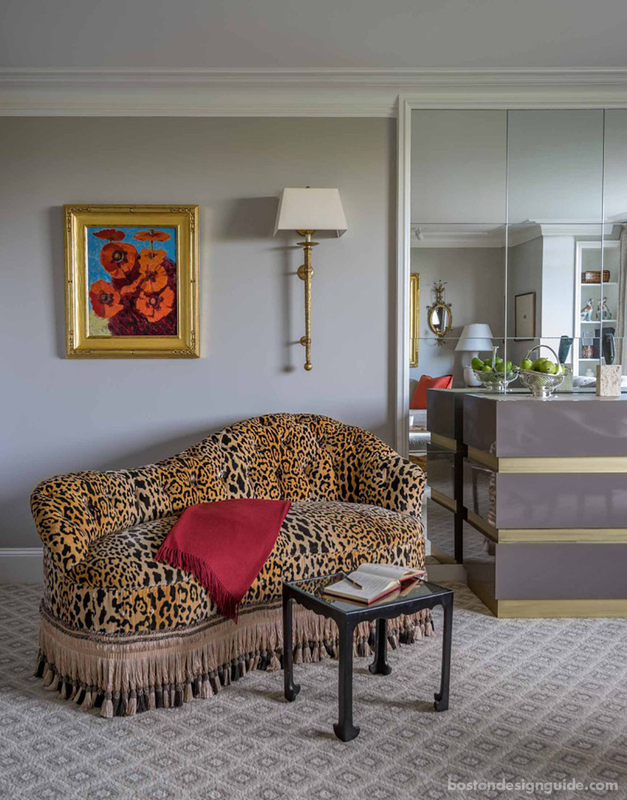 Often, interior designers—like Anthony Catalfano, above—showcase one fabulous piece upholstered in an iconic animal print for a stately flair.